Chocolate gingerbread cookies: Loaded with warm spices, dark brown sugar, molasses, and candied ginger, these cookies will make your whole house smell just like Christmas! For two years, every time I pull out this cookbook, these drool-worthy cookies have been staring me down. Begging me to make them. The first Christmas with this book in my possession, I had no clue which recipe it was. Last Christmas, I had them on “the baking list” but they never got made and I vowed to make them this year. And goodness gracious am I happy I made them a priority this year! These chocolate gingerbread cookies are, by far, some of my favorite cookies to date. They are definitely in the top 5 best Christmas cookies I’ve ever made! Loaded with warm spices, dark brown sugar, molasses, and candied ginger, they smell amazing while baking. They will rock your Elf on the Shelf, Muppet Family Christmas, or It’s a Wonderful Life world (depending on which generation you are a product of) once you bite into them. 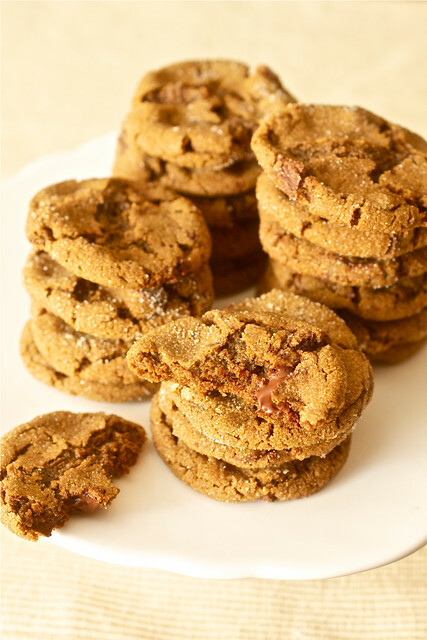 The chocolate chunks and cocoa powder lend an extra level of greatness to these soft and chewy gingerbread cookies and I dare you not to go back for seconds! 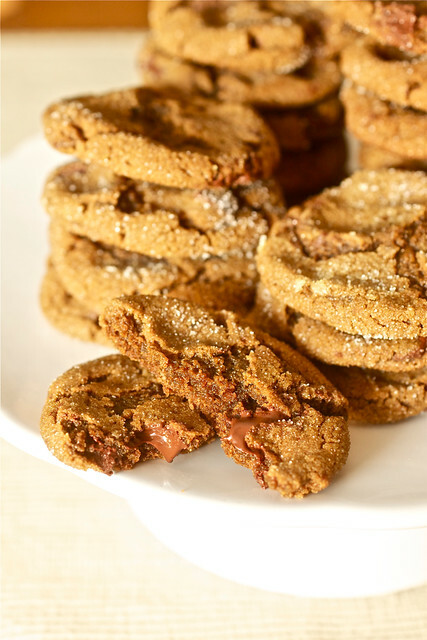 If for some reason, you think you don’t like gingerbread, please give these cookies a chance. They are irrestibly chewy and taste just like a great Christmas cookie should. These cookies do, however, have a really good punch of gingerbread flavor so if you’re looking for a cookie with a more mild flavor, you need to try these white chocolate gingerbread blondies. Be sure to allow for at least 2 hours of chill time for the dough before baking. Line two baking sheets with parchment. In a medium bowl, sift together flour, ground ginger, cinnamon, cloves, nutmeg, and cocoa. In the bowl of an electric mixer, fitted with the paddle attachment, beat butter and candied ginger until whitened, about 4 minutes. Add brown sugar; beat until combined. Add molasses; beat until combined. In a small bowl, dissolve baking soda in 1 1/2 teaspoons very, very hot (or boiling) water. Beat half of flour mixture into butter mixture. Beat in baking-soda mixture, then remaining half of flour mixture. Mix in chocolate. Turn out the dough onto a piece of plastic wrap. Pat dough out to about 1 inch thick. Seal with wrap and refrigerate for at least 2 hours or up to 1 week. Preheat oven to 325 degrees F. Roll dough into 1 1/2- inch balls; place 2 inches apart on baking sheets. Refrigerate 20 minutes. Roll in granulated sugar. Bake until the surfaces crack slightly, 10 to 12 minutes. Remove sheets from oven. The cookies will be puffy; if you are ok with that, cool them for 5 minutes then transfer to a wire rack to cool completely; if you want them a little flatter (my preference), gently and carefully flatten them with your fingers then let them cool 5 minutes and transfer to a wire rack to cool completely. Was just going through your site to find a good christmas cookie recipe – this could be the trick. Thanks! These look absolutely heavenly. Can’t wait to try them! These sound lovely! I’ve never tried putting chocolate with ginger! I’ve had such a tough time deciding which cookies to make for our exchange at work. I think these cookies may be perfect! These sound so wonderful – I’d be hard-pressed to find anything that isn’t made better with chocolate. I will be trying these even if I don’t win your giveaway! I adore gingerbread! Luckily my husband likes it too, so I actually make it all throughout fall and winter. Thanks for the great post! I made these tonight and they are wonderful. I will be blogging about them tomorrow. Thank you again!